Faucet package includes water hoses with 9/16-24 UNEF female connector, U.S. standard size. 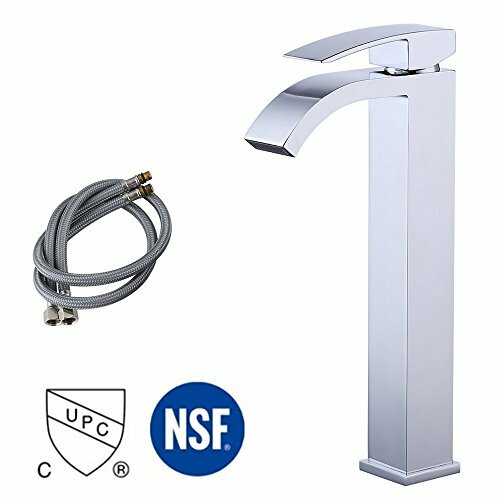 cUPC and NSF Certified: The faucet body are made by LEAD-FREE brass (with less than 0.25% lead content), complied with NSF/AB1953 lead-free regulation and safe for drinking water. This faucet also have cUPC, IAMPO certifications, conforming to U.S. national quality standards. You will get a high quality and safe faucet product for sure! LEAD-FREE BRASS WATERPIPE: Faucet body and waterpipe are made by lead-free brass (with less than 0.25% lead content); useing ravity casting technology make the thickness of the faucet is uniform, and the faucet is corrosion resistance, explosion-proof, leakage prevention. HOSE INCLUDED: Including 60 CM or 24-Inch hot & cold water supply hoses, standard 9/16-24 UNEF threads, you can easily connect our hoses with your stop valves. Smooth, long lasting, drip-free operation ceramic disc cartridge.